Author Mallory Neeve Wilkins chats about her books, writing clubs, gossip and friendships. A house carries energy from the land, the architect, the builder, all those who worked on it, lived in it and every 'thing' inside it. Preview Video. Sacred studies indicate that changes within your environment impact your moods, health and lifestyle. China and India have for millennia mapped the path of the Earth's subtle energies, endeavoring to bring harmony and well-being to all people. From around the world, laundry art appears in the strangest places as people display their delicates for all to see. Back in the day... as they say, I lived in Peterborough Ontario raising my children with my husband Dan. We enjoyed and loved the olde area and landscape of historic old-town Ontario. During these years, a recession set in and many a day we lingered together sketching the buildings, landscape and scenery while we worked hard designing and building our dream home on Weller Street. Feng Shui and designing the best kitchen island is done by removing straight lines and adding curves and insets... straight lines cause the path of energy to flow too fast, turning negative. Feng Shui encourages a meandering path to keep the energy flowing positive without the danger of sharp edges and drastic corners. This youtube video will help visualize the concept. Best Summertime Books for a Good Read! Relax, it's summertime, enjoy a good book! Summertime reading together? Staying together! It's that wonderful time of year again... time to relax and enjoy a good read during the holidays. Over the last 8 years, I have been actively writing and photographing and preparing youtubes of my books for my fans, during which time I have published two novels inspired by true events, two non fiction Fun Schway How-to books, 2 photography books, journals and calendars. The variety is for you to review and select your favourites for yourself, gifts, sharing, book clubs, meet-ups etc. Available online through your favourite book retailer source www.mallorysdesign.com ... by title, author name (Mallory Neeve Wilkins) or through an online retailer... in ebook, paperback, hardcover, kindle etc... Options of having them delivered right to your door; downloaded immediately or gifted and delivered to your friends. 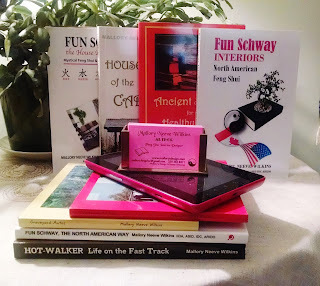 Enjoy my new 'fun' book trailer 'Fun Schway Interiors' and thank you for subscribing to my YouTube channel. Available online in print & ebook. Barnes & Noble - Mallorys books.